The St John's East Rotary Club met this morning 7:30AM at the Sheraton Hotel. It was the classiest setting I have seen yet for a Rotary Club. They served a terrific breakfast with 3 kinds of eggs, breads, etc. I didn't see any cod tongues on toast. We then headed for Witless Bay but found the whale watching boats leave from Bay Bulls. 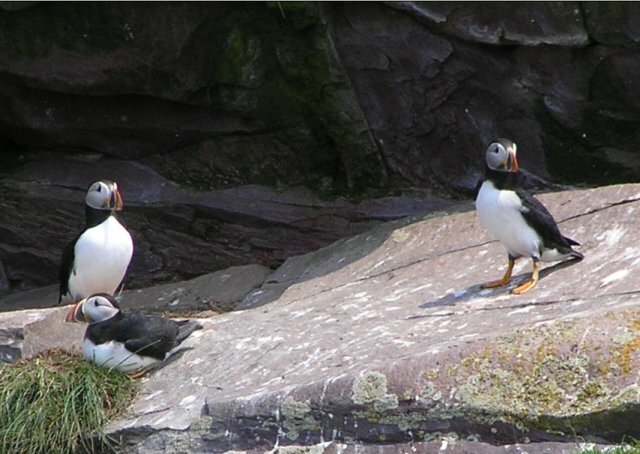 We did see a couple of humpback whales but found the puffins on Gull Island were the most interesting. (see photo that Mavis took). The puffins are very unique birds. Check out Google for all the details. We also had a good time talking to a family of native Newfoundlanders on the boat. They come out every year to see the whales. The man lives in St John's and is an account manager for Blackberry and travels to Knoxville, TN several times a year. Another couple from Oakville near Toronto, asked all kinds of questions about the View. We invited them to tour and they were really impressed until the door handle fell off the bathroom door. I have wondered for long time where the set screw I found a year ago on the floor came from. Now I know, but can't find where I put the set screw. Next we drove to Cape Spear, and stood on the most easterly point in North America at Longitude 52 degrees, 37 minutes, 14.7 seconds according to my GPS. Cape Spear has a restored 1839 lighthouse and also a large gun emplacement that was built for World War II to defend the St John's harbour. As the wind was blowing nicely, we decided to try out the kite we bought at Cape Hatteras. As soon as I got it up in the air the park commissionaire came over and said that kite flying was not allowed. If the string were to break it might get caught in a jet on the approach for a landing at the St John's airport. Hardly likely given that kites don't fly if the string breaks; however, it was time to head back to town. We got a call from Marina-Atlantic that our ferry trip tomorrow was being delayed about 6 hours. I'll have to re-plan the trip from Sidney to Ottawa.